4. Audi A4 Allroad | What Car? This is the Audi A4 Allroad, a high-riding, four-wheel-drive version of the A4 Avant. Styling changes emphasise the car's off-road credentials, and include bigger bumpers, stainless steel body guards, flared wheelarches and 17-inch wheels. Audi says that the car will ride and handle well on all types of surface, with stability control and a system called Offroad Detection to help it out on rough terrain. Three engines will be available from launch: one petrol and two diesels. The 211bhp 2.0-litre petrol engine has 258lb ft of pulling power, propelling the car from 0-62mph in 6.9 seconds, and has a top speed of 143mph. It's linked to a six-speed manual gearbox as standard and averages 29.0mpg. The 170bhp 2.0-litre diesel also has 258lb ft of pulling power, hits 62mph in 8.9 seconds and has a top speed of 132mph. It's linked to Audi's seven-speed S tronic semi-automatic gearbox and averages 36.8mpg. The 240bhp 3.0 V6 diesel has 369lb ft of pull, and with the S tronic semi-automatic gearbox it reaches 62mph in 6.4 seconds. It has a top speed of 146mph and averages 33.1mpg. Luggage capacity is 490 litres with the seats up and 1430 litres with them folded down. There is also a load hatch, through which skis can be stored. Safety kit includes front, front side and head airbags. Rear side airbags are available as an option. The head restraints also move in the event of an accident to reduce whiplash injuries. Other standard equipment includes alloy wheels, foglights, a headlight washer system, roof rails, climate control and a push-button handbrake. Optional kit includes Audi's MMI sat-nav system, a two-part panoramic sunroof, electric tailgate, three-zone climate control and xenon headlights. Safety systems, such as lane assist and adaptive cruise control, are also available. 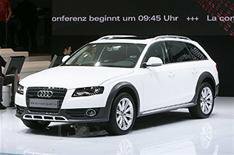 The Audi A4 Allroad will go on sale this summer. Prices are expected to start from 29,285. Why we didn't like it Dull, dull, dull. It'll take more than plastic cladding and flared wheelarches to impress us.